What happens to relationships when trust is lost? I would suggest that trust is an essential part of any healthy relationship. 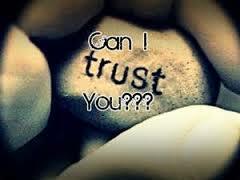 If we don’t trust another person we will find it difficult to attach to them or allow them to attach to us. Healthy relationships take time to develop. Sometimes we trust too quickly or we don’t trust anyone and hold people at arm’s length. Do we trust our own sense of judgement or ignore it even when our silent internal dialogue says ‘be careful?’ How do we respond when someone we had thought was trustworthy does something which betrays our trust in them? We can assume that loved ones are always trustworthy. Sadly, this isn’t always the case. Let’s reflect on trust in our personal relationships – those whom we love and love us. For those relationships to grow and deepen we need trust to feel safe. In my clinical work I see many situations where trust has been broken or lost – perhaps with an affair or lies about finances or something else. Often people are taken by surprise that someone that they have spent many years with and have trusted has betrayed them. Shock and numbness followed by sadness, despair, anxiety and anger are normal responses. Breaking trust is a betrayal It is a loss which needs to be processed and grieved. This takes time, just as it does in any bereavement. Before it is possible to go forward it is important to look back at what was going on in the relationship before the betrayal. Looking closely will unearth some clues that can be worked on towards potentially repairing the rupture in the relationship if that is appropriate. People often want to return to ‘the honeymoon period.’ This isn’t possible. Once trust has been broken things can never be the same again. That’s not to say that relationships can’t be re-built but they will be different. At work too relationships can break down. People we have worked with for many years may begin to behave differently and we can find that they are bullying or side-lining us. Often this is subtle and cloaked in words like ‘I am only joking.’ This can lead to a sense of isolation and wondering who we can trust and if there is something wrong with us. Self-esteem can be badly damaged. Sometimes people can feel helpless and powerless. As a Counsellor it is vital that I am able to establish trust with my clients. Often people have experienced a lack of trust and rejection in other relationships and don’t necessarily find it easy to trust another person. I see my role in part as providing a safe place where trust between us can be established. This then enables clients to share their story and process their thoughts and feelings. They are then empowered to make the choices that are meaningful for them to help alleviate their distress. Are you Feeling Stuck and Anxious?